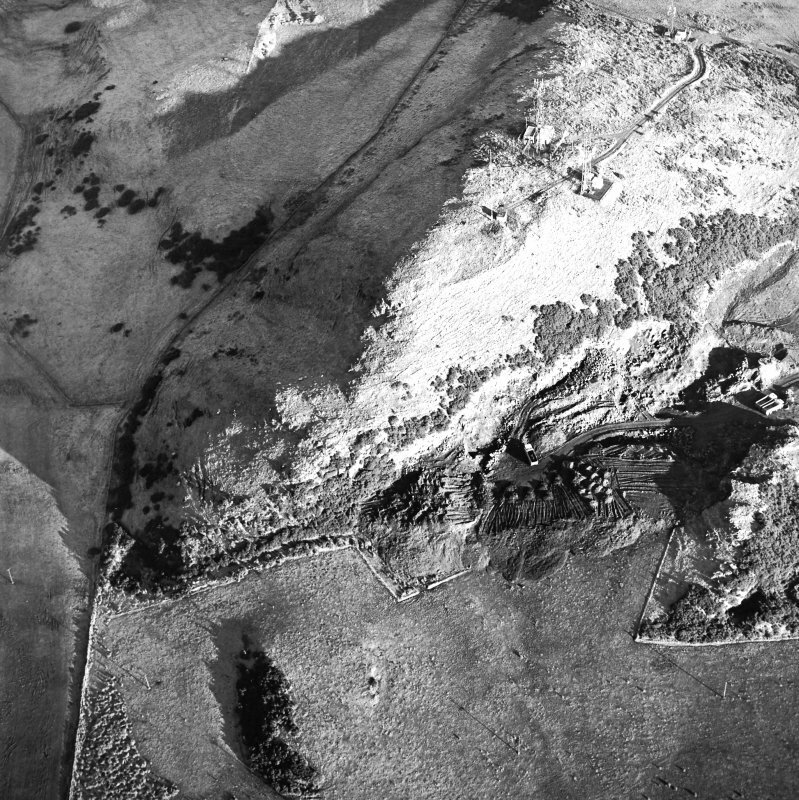 Plane-table survey; fort, Myot Hill. 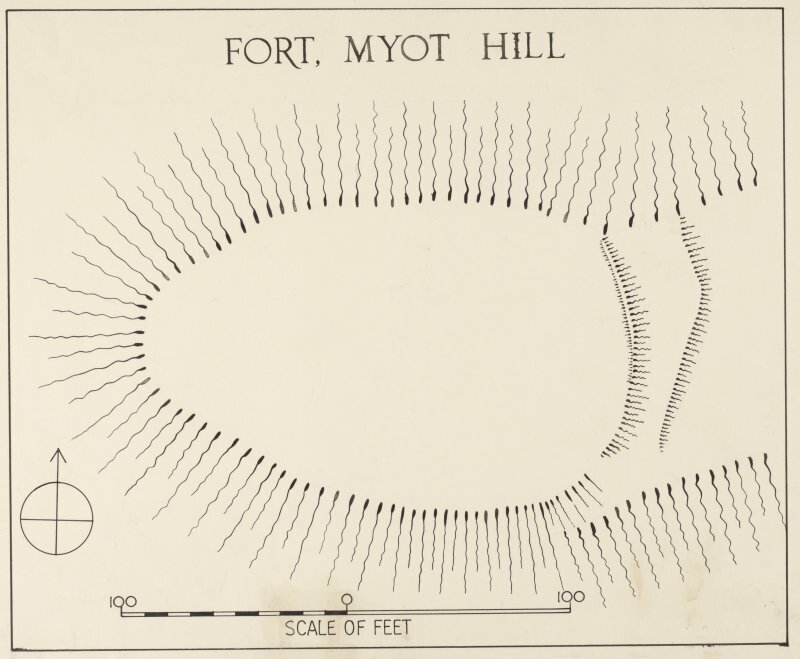 Plan of Myot Hill fort. Alternative version. 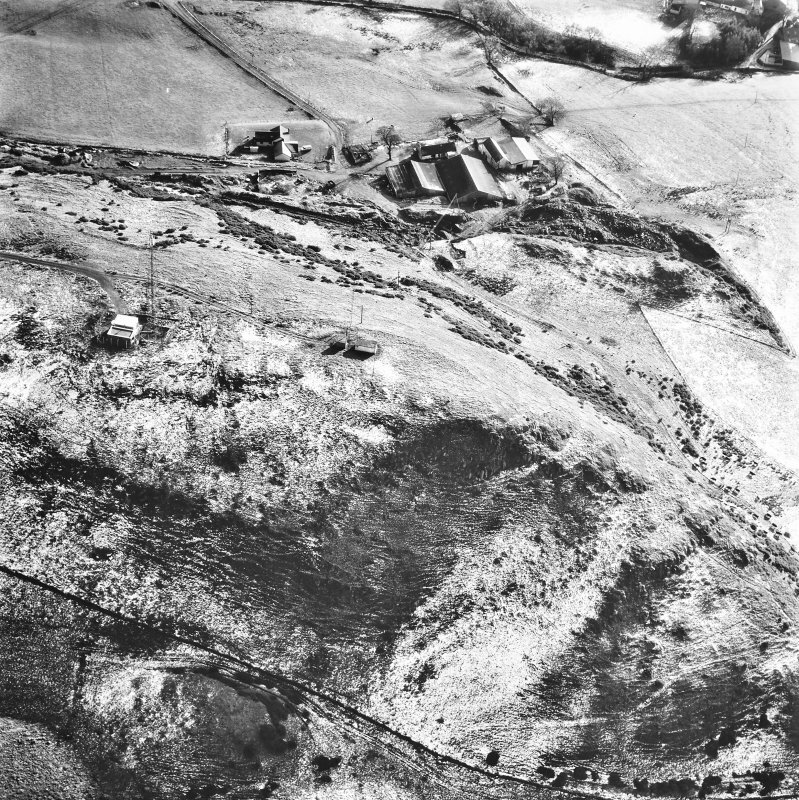 Oblique aerial view centred on the radio station and the remains of the fort with the quarry adjacent, taken from the NW. 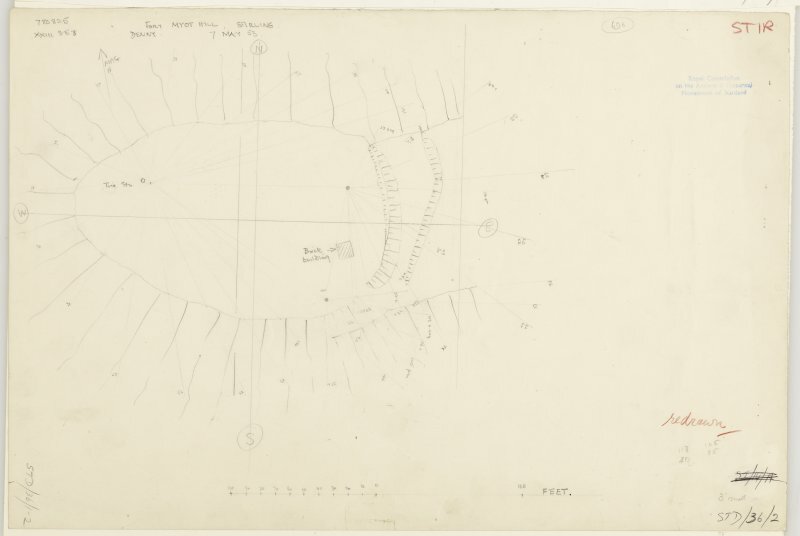 Publication drawing; fort, Myot Hill. 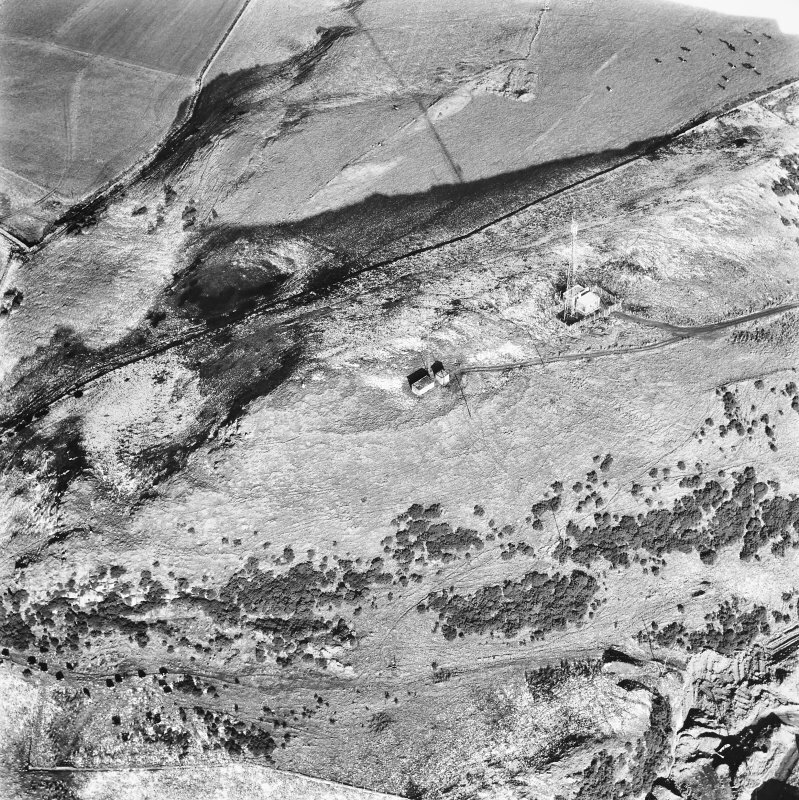 Oblique aerial view centred on the radio station and the remains of the fort with the quarry adjacent, taken from the E.
Oblique aerial view centred on the radio station and the remains of the fort with the quarry adjacent, taken from the SE. 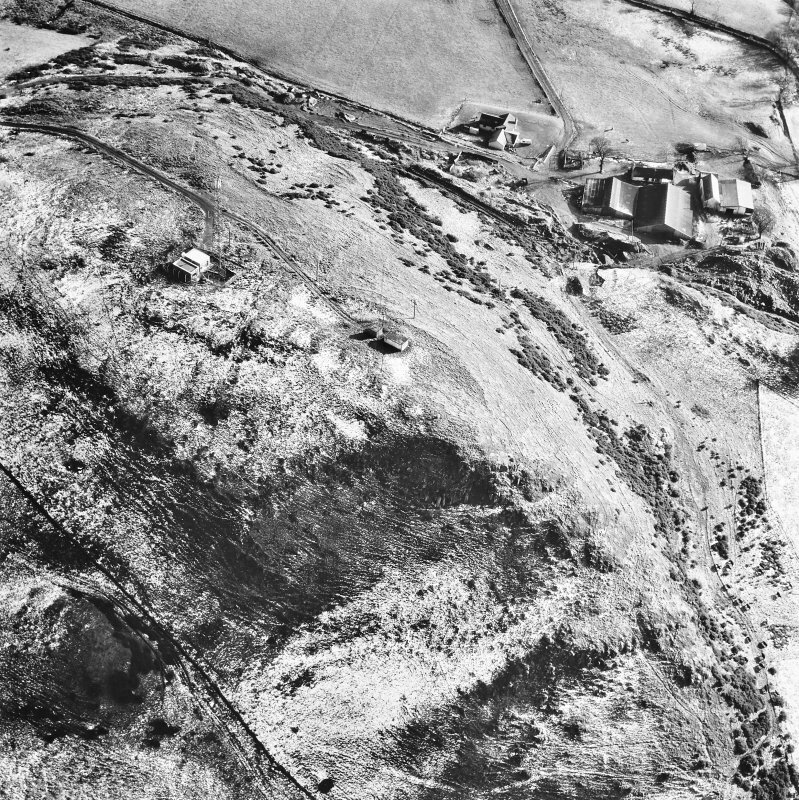 Oblique aerial view centred on the radio station and the remains of the fort with the quarry adjacent, taken from the SW.
A fort is situated on the summit of Myot Hill. 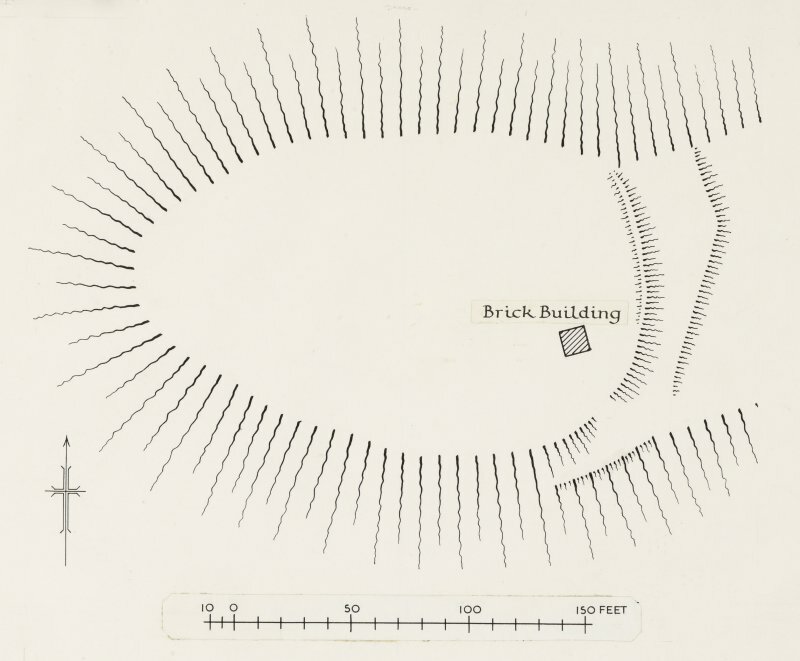 Almost obliterated by stone-robbing and weathering, it is oval on plan and measures 215' E-W by 140'. 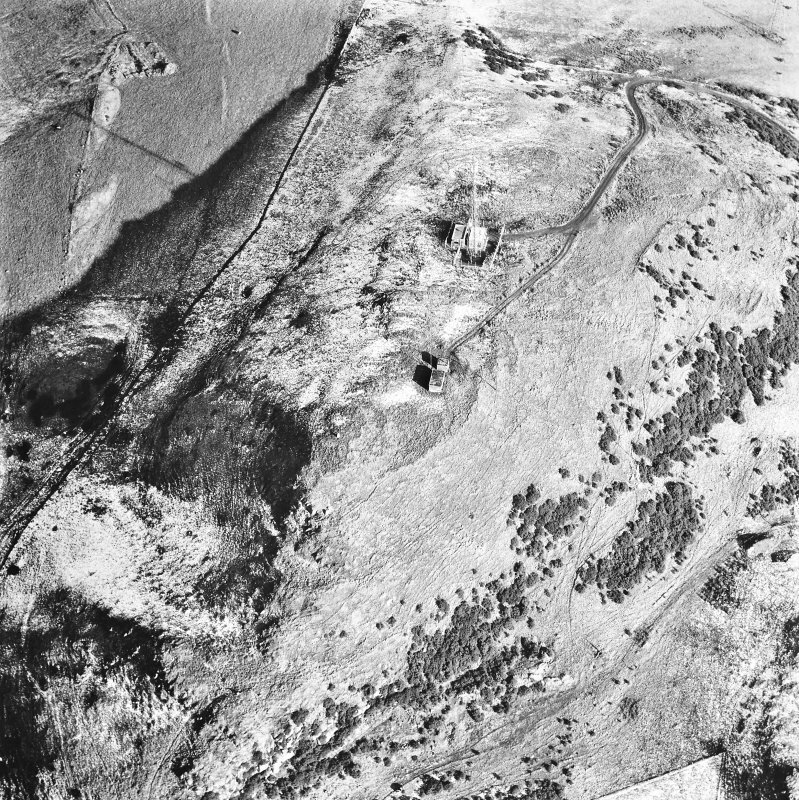 No traces of defences may be seen along the crests of the steep slopes to N, W, and S, but the slopes to the E are traversed by the mutilated remains of two ramparts. 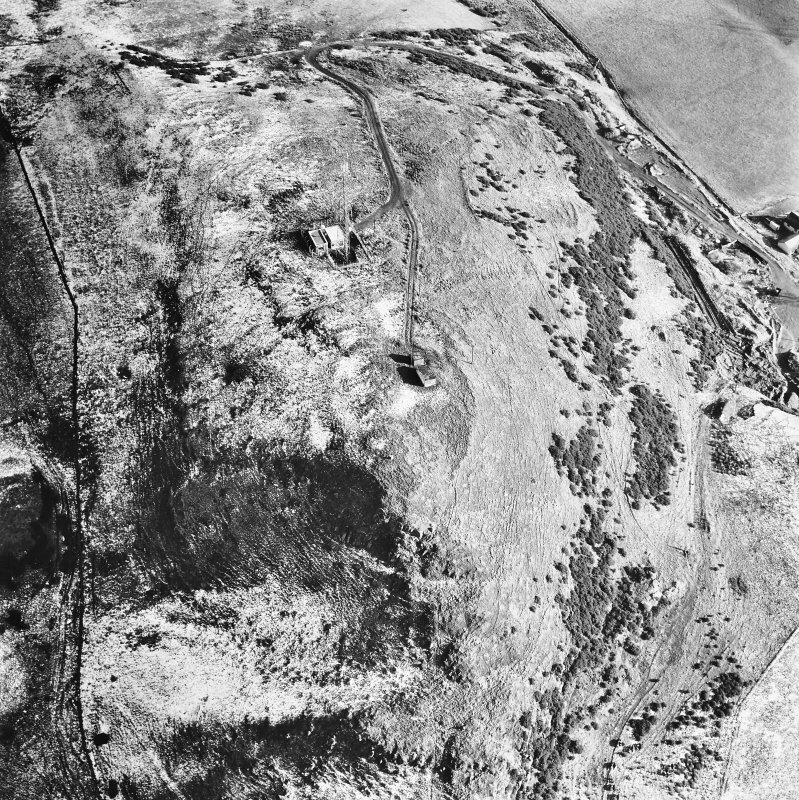 The inner one, a low mound spread to a width of 13', runs S from the crest of the N slope for 105'. After an 11' wide gap, which must represent the original entrance, it continues as a low scarp for 25' before merging with the slope of the hill. 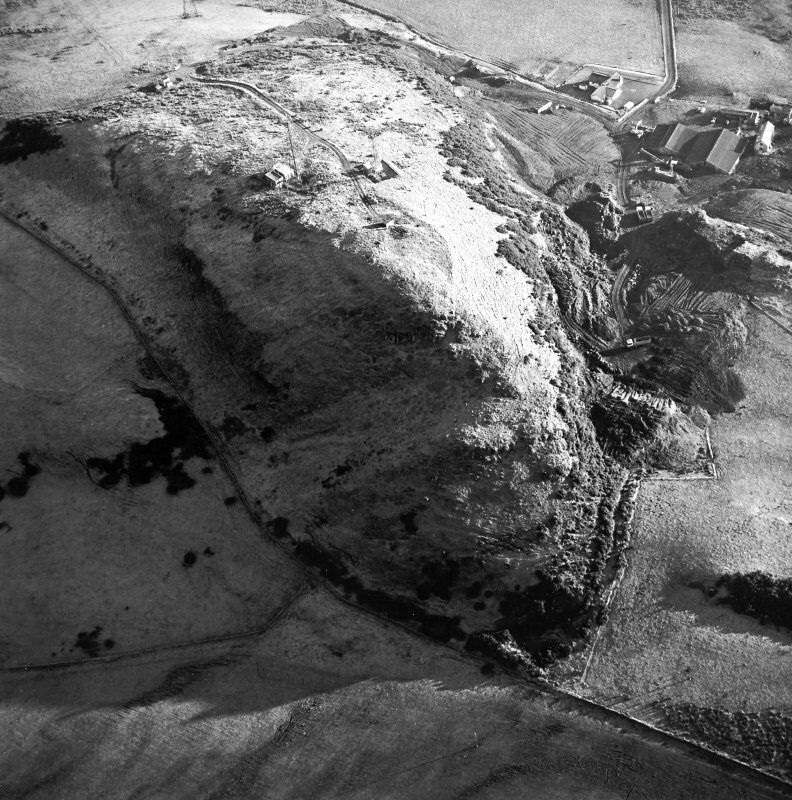 The outer rampart, only a low scarp, runs along a similar line to the inner one. Apart from a small modern building, the interior is featureless. 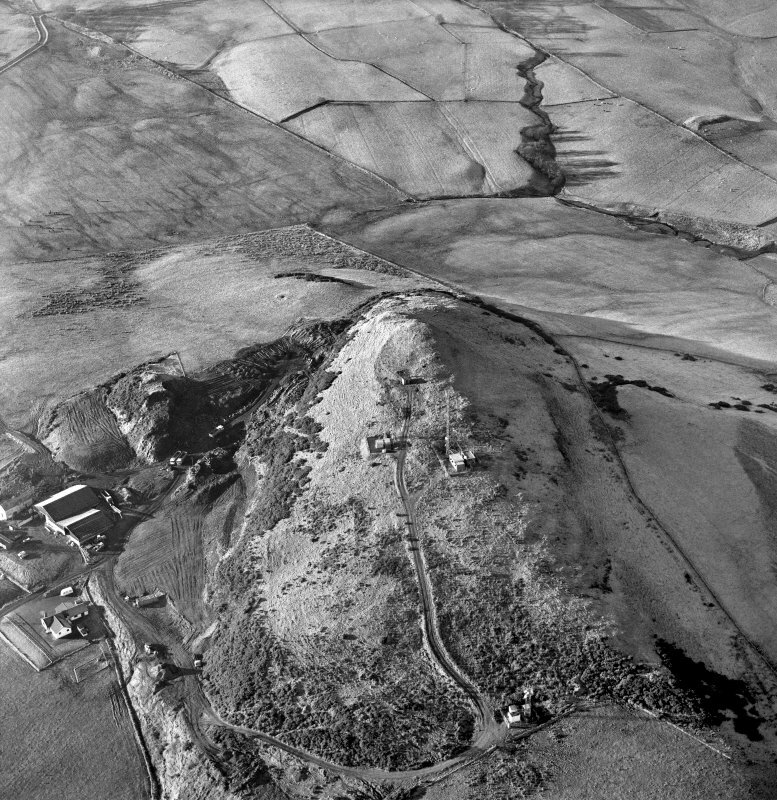 The possible connection of the place-name Myot Hill with the tribal name Maeatae is noted by Watson. A fort generally as described. 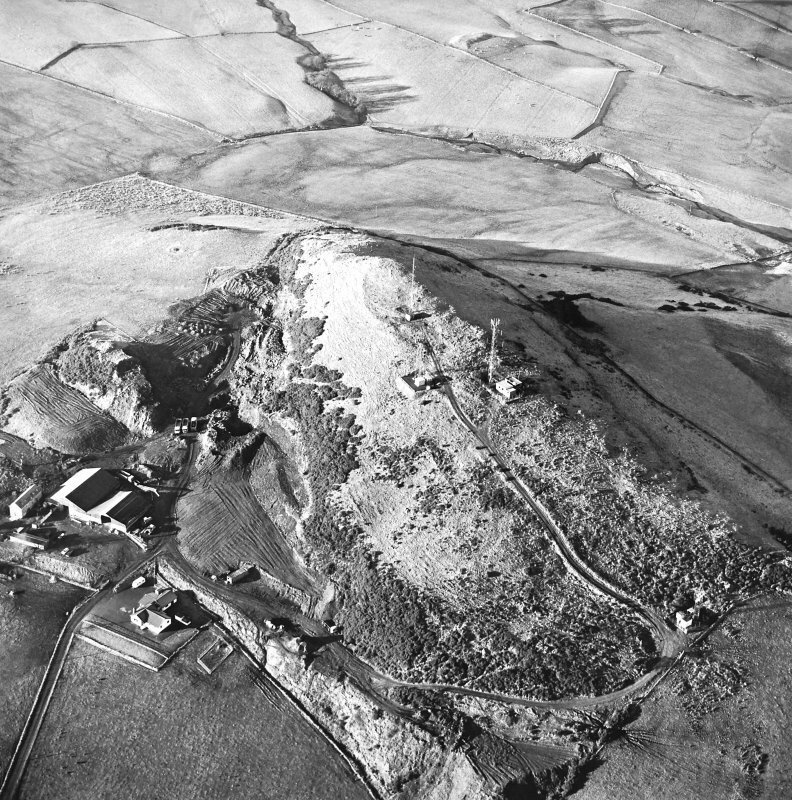 The scant remains of a fort are situated on Myot Hill a steep-sided summit W of Denny that is now crowned by telecommunication masts. 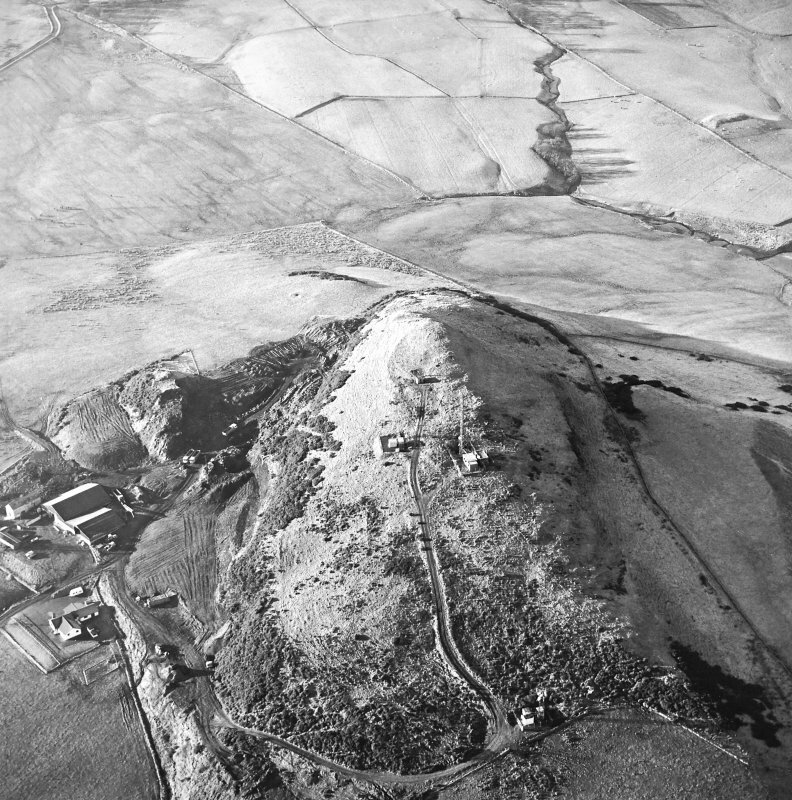 There are no more than traces of defences around the N, W and S margins of the hill, but on the E two heavily robbed ramparts can be seen, creating an enclosure measuring about 65m from E to W by 42m transversely (0.18ha) on the summit. The entrance is probably on the ESE.